My friend Mindy is turning her great room loft area into a playroom for her little girl, Gabbi. She picked out some fabric and asked my opinion for the rest. She has an existing olive colored couch that will be staying in the room but everything else is fair game. Here's what I put together. Click on the design board to enlarge. Because one side of the room is open to the living area below, I wanted to keep the color palette as neutral as possible while still pulling out some of the colors from the "Pretty bird" fabric so I chose two varying shades of chartreuse. And to bring in some brighter and more girly colors for Ms. Gabbi I thought purple stripes could be incorporated on one of the walls that is hidden from view below. I anchored the room with an aqua shag rug that is both playful and comfortable. 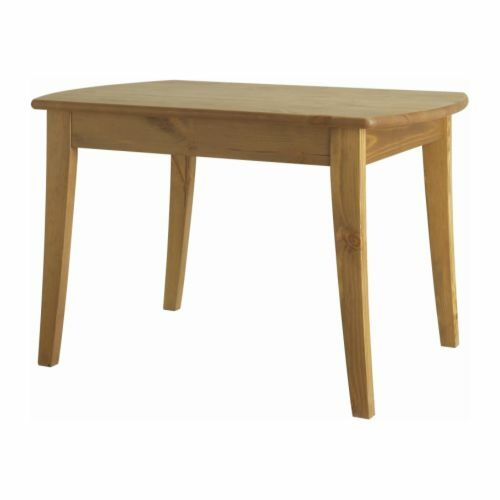 I chose a wooden kids table for arts and crafts because it is the very durable and any nicks or scratches it gets will only add character. 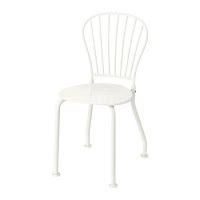 I love mixing and matching furniture styles so the contemporary green stool and white wire chaired were perfect. 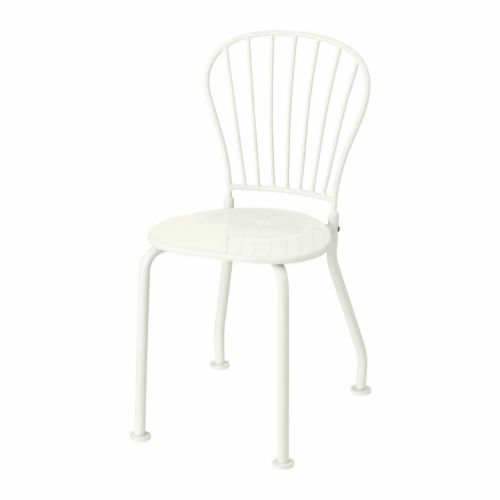 Plus the white will coordinate with the white side table and toy chest that Mindy has already purchased. For artwork, I kept it simple and playful. I love the different takes on the saying "Keep Calm and Carry On" and found a store on Etsy that will custom design a poster for you. 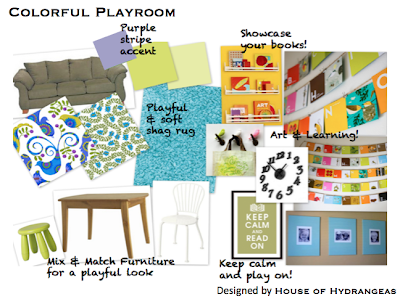 I think "Keep Calm and Play On" would be the perfect motto for the playroom. I also found this flash card wall idea, created by Sarah Hartill, the Style Editor at Canadian House & Home Magazine. 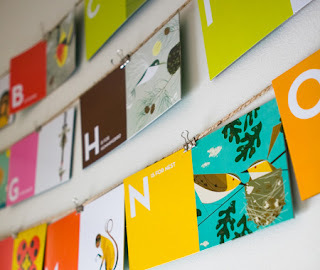 All you need is twine, nails, bull clips and flash cards (Charley Harper cards shown here). Hang twine from the nails and attach the flash cards with bull clips. You add instant color and interest to your room while educating your child at the same time. When your child gets older, you can remove the alphabet cards and use the twine to showcase their artwork. Another easy and inexpensive idea is to buy canvases (shown in the bottom right corner of the board) and paint them in a complimentary color. Next, print glossy black and white photos of your kid(dos) and attach them in the center of the canvas. Bird hooks carry the theme from the pillows over to the wall and add a whimsical touch. 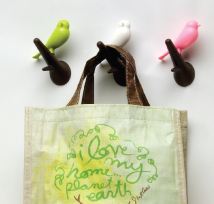 Plus they are perfect for keeping purses and other girly dress-up items off of the floor. And lastly I recommended collectors bookshelves over a regular book case. 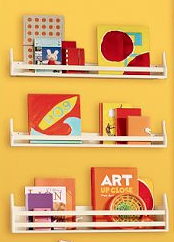 Using these shelves allows you to display the covers, making them more like artwork than anything else. Plus, because the shelves are hung on the wall, you save more floor space for playing!